If you've walked into a wine store anytime since November 16, you've undoubtedly seen a brightly colored display, proclaiming "Le Beaujolais Nouveau est arrivé!" filled with a bunch of fancy bottles, likely from Georges DuBeouf. I'd be shocked if you haven't seen it. 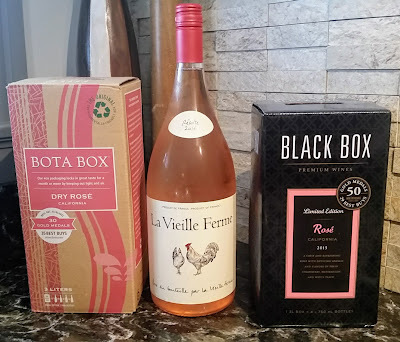 A Vine reader asked me if I was going to write about this year's crop of Nouveau, so let me give a little backstory behind this wine and why its "arrival" is such a big deal before I get to them. Beaujolais Nouveau are made from the same grape as regular Beaujolais -- gamay. These wines are fermented extremely quickly through a process called "carbonic maceration." In layman's terms, they throw the grapes into the fermenter whole, and the weight of the grapes themselves does the crushing. Most of the fermentation happens to the juice while still inside the skin. As carbon dioxide is released by the fermentation process, the bubbles speed the alcohol production and helps gravity stomp the grapes. An entire batch of Beaujolais Nouveau can be fermented in as little as three days. The tradition of drinking this young wine started in the villages of the Beaujolais region, where people would draw jugs of wine out of the fermenting casks. This wine was to hold folks over until the actual Beaujolais was ready, several months later. This "first batch" of wine was a great excuse for a party, and villages would have festivals surrounding the sharing of this new wine. Eventually, word of this little tradition got out -- since everyone wants to be festive. A rush started to see who could get wines out first. Eventually, the French government stepped and in 1951, this wine was made an "official" varietal -- with a release date of November 15th. Georges Dubeouf came along in the 1960's and started to publicize the release of the wine widely -- and it's now become a worldwide, rather than a regional, day of excitement. Beaujolais are light wines to begin with, but Beaujolais Nouveau takes this to a whole other level. These are extremely young, uncomplicated wines. They are not really made to go with food. As I said, they're made to be festival wines, drunk from jugs as people dance around in the streets. You certainly don't have to think much about how these taste. Georges DuBeouf 2006 Beaujolais Nouveau -- the most ubiquitous Beaujolais Nouveau on the market. DuBeouf shells out plenty of cash to assure that the world wine market is properly flooded with the Nouveau. You can find this wine…well…everywhere. The nose is very light and fruity -- the usual cherry notes of Beaujolais are in there somewhere. The first taste doesn't give you very much, but it expands to a little fruitiness…which unfortunately is still too young to get much more than an inkling. I guess you could say that there's some cherry flavor there with a little bit of licorice. Finish is dry with a little fruit. The body is very light. You could basically drink this like water if you were so inclined. You can find this for $9-11 anywhere. Joseph Drouhin 2006 Beaujolais Nouveau -- this is a darker and fuller wine than the DuBoeuf and seems much more like a wine that could be more than simply slugged back. Some light berry flavors on the nose. The Drouhin tastes a little more "done" than many Nouveau I've tried. There's a slight smoky flavor to start, but that turns to a tart cherry flavor, which leads into a fruity finish that I wouldn't expect in a nouveau. This wine finishes dry but not tannic (as most Nouveau have very little tannin). If this wine is any indication, make sure that you look for the actual 2006 vintage of this winemaker. I have a feeling you won't be sorry. This will run about $12-14. I'll be honest…it's not my favorite wine. I think there's really not much to it -- but as I’ve said, uncomplicated wines don't scare me. However, uncomplicated wines shouldn't cost an arm and a leg. Beaujolais Nouveau was very inexpensive for a long time. Over the last few years, since the release has become an event and there's money to be made, the price has skyrocketed. There are some wine aficionados who say that the Nouveau holds the secrets of the upcoming year's Beaujolais vintage. That may be -- but I'd rather wait and see for myself. In my opinion, there's no reason to spend $12 on a bottle of Beaujolais Nouveau if you can spend $6-8 on a Beaujolais-Villages (or heck, drop the $12 on a cru!) and get a far superior wine for your money. But don't just take my word for it. Do a side-by-side tasting and see for yourself. The Vine will be taking a week's hiatus for Thanksgiving and to give my liver a rest. See you in December, everyone! Until next time…enjoy the Thanksgiving sales, and please don't riot over the Playstation 3. We did not wish to follow the Sideways trail. We did a little research beforehand and asked a few friends for recommendations. We ended up floating from winery to winery, sampling and learning as we went. My lessons from the trip? * The best tasting rooms are at the wineries themselves. * Tasting rooms specializing in local wineries without their own tasting rooms often yield gems. * The pinot noirs out there are incredible wines. Corollary: The pinot noirs out there are also expensive wines in relation to what I usually write about. * When I went to Sonoma last year, I barely drank zinfandel -- then I fell in love with the stuff. The same thing happened to me in Santa Barbara with syrah. Cellar 205 -- One of our first stops, Cellar 205 is a wine co-op tucked away on a back street in Santa Barbara. Three different winemakers produce their wines here. Carr Winery specializes in pinot noir -- their pinot is very complex and range from delicate to chewy. They also make a very tasty sauvignon blanc. (We bought a bottle of the pinot for a special occasion.) Bargiel focuses more on syrah -- big, hearty wines. Our favorite was Oreana. Oreana makes a range of wines -- the most memorable, for me, was simply called "?" -- as it's made from a different blend of grapes every year. This wine was one of the more inexpensive we ran into out there -- $10 a bottle. For the price, it was unbeatable. This wine would be perfect to bring to a party, open in the evening with some chocolate, or just kick back and drink. Lots of berries and fruit, soft tannins, and hearty without being overpowering. We ended up with a case of the stuff. Giessinger -- A funky little place on State Street in Santa Barbara, Giessinger made wines that, in the words of one of our tastresses (both of whom had the same birthday) are "not your average wines." I would echo that sentiment. We got a bottle of their syrah -- which actually had a fairly strong flavor of mint to it. I'm waiting to get some lamb chops for this wine, since we wouldn't need the mint jelly to go with it. At $10 a pop, it seemed like a pretty good investment to me. They made a few other very nice whites, as well Giessinger's specialty is dessert wines, which aren't usually my speed. But with wines named "Forgiveness" and "Surrender" -- trying them became a must. Zaca Mesa -- Zaca Mesa, north of Los Olivos on Foxen Canyon Road, focuses on what are considered "Rhone varietals." The climate in that area is very much like the south of France -- blazing hot in the day, cool and breezy by night.They grow the same grapes there -- syrah, mourvedre, Grenache, rousanne, viognier, etc. Our new friend Brian led us through the tasting soon after an extended conversation with us about the Bengals being underdogs against the Ravens. They made a viognier that started with a wonderful floral and fruit nose, which then became wonderfully crisp and refreshing. Their blends, Z Cuvée and Z Three, were extraordinarily tasty and full wines. But their syrah stood alone on top. Syrah is normally a powerful, fruity, earthy wine. When you taste a syrah, you're going to get a very strong flavor of…well…something, generally – these are not meek wines. Zaca Mesa…these folks made a syrah that's very different. Their syrahs weren't overpowering in the slightest -- in fact, these wines had some of the best combinations and balances of flavors I've ever had. Almost all of their syrahs could be termed "elegant." Most of their wines are out of the Vine range -- but when we were there, they were selling off the last of the 2001 vintage -- which was an incredibly good wine, but needs to be drunk soon. We got it on sale -- so it came out to about $10 a bottle. If I need to take a bottle of wine somewhere in the next few months -- this is coming with me. It's astoundingly good. Curtis -- Half a mile up the road from Zaca Mesa, Curtis Winery also focuses on Rhone varietals -- and our taster, Jason, showed us a very pleasant time while we were there. They also produce an exceptional syrah and small batches of various other Rhone wines. We were most struck by their cuvées. Cuvée is WineSpeak for "blend" and, as mentioned above -- these are usually very tasty, very up-front, easy drinking wines. Curtis makes three of them: the "Heritage Cuvée," a red with a smoky cherry and vanilla taste; the "Heritage Blanc," a white, somewhat like a viognier on the nose, but with a crisper taste and a longer finish; and their "Heritage rose," made from the same grapes as the red and striking you with tasty berries and grapefruit. All these wines were relatively inexpensive ($12-16) and make for a wonderful introduction to some of their other wines, which are a little pricier but, again, quite worth it. And while the following wineries aren't in this column's price range, they certainly bear a mention: Sunstone -- the most attractive winery that we visited. Sunstone is just north of Solvang – best known as California's Dutch version of Gatlinburg. We tasted the best rose we'd ever had at Sunstone and a wine called "Eros" that was…well...exactly that. Shoestring is a new winery located smack dab on the road between Buellton and Solvang. They were tasting their first releases when we visited. If the early returns are any indication, this winery is certainly one to keep an eye on. Their syrah paired with dark chocolate was particularly divine. The winery also starred Scooter the Aussie, who kept an eye on the place from his perch atop one of the barrels in the warehouse. Finally, Foley, in the somewhat less radical climate west of Buellton on the way to Lompoc, produces absolutely marvelous pinot noir. We bought ourselves our favorite pinot on the trip at Foley. Pay the homepages of these wineries a visit and read their stories -- you'll like them. Each winery had a tale to tell -- and the thrill of firsthand discovery made for a very memorable mini-vacation. Cycles Gladiator 2004 Merlot -- When a bartender gives an honest recommendation, listen. JenJen, the Tavern Wench herself, mentioned this merlot several weeks ago in a comment on my merlot column and I decided to give it a swing. Cycles Gladiator was a French bicycle company in the 1890's, and the wine label (to which JenJen also referred) bears the artwork from those old posters. This merlot is one of the more interesting I've tried in awhile. The nose is very full -- and, to me, smells like what in WineSpeak they call "cassis" -- which to the rest of the world would be currant. There's also a little chocolate smell mixed in. The taste is wonderfully complex for a wine this inexpensive. There's a solid plummy flavor that gets balanced by a little acidity. You might read descriptions of the tannins in wine as "chewy." If you want a good example, try this wine -- it's got very rich body along those lines. There's a little more acidity on the finish that you'll find in many merlots, but that rapidly gives way to a nice dark chocolate flavor. While all merlots are relatively food friendly -- this one's got enough body and structure to hold up to even a good cut of steak. But it'll work with almost anything -- from mac and cheese to duck. If you're still wary of merlot, hop on the Cycles for $8-10. Like they say, you never really forget how. Also, make sure you pay the Tavern Wench a visit. If you've ever wondered what those folks pouring your drinks on the other side of the bar are thinking -- it's a must-read. JenJen gives you an Anthony Bourdain look at the world of bartending -- except she's considerably easier on the eyes. Santa Ema 2004 Barrel Select Carmenere -- In my Chilean column, I made a erroneous statement about Carmenere, one of the red wine grapes common in Chile. I said that it was the same thing as merlot. Sharp-eyed and knowledgeable vine reader Scott S. forwarded an article informing me that Carmenere was a completely different species of grape -- not simply a regional version of an established varietal. Many thanks to him -- and I decided to give one of these a try. The Santa Ema is the first Carmenere I've had the fortune to try. A quick swirl brings a fairly light nose that reminds me of chocolate covered berries. This wine has moderately tannic taste and medium body. It's not quite as big as the Cycles, for instance, but it won't be easily overwhelmed. The taste is a little less fruity than most merlots. Instead, if you were looking for a comparison, it's got an earthy taste similar to some French merlots -- although not nearly as complex. The finish is longer than most merlots, and certainly drier. You could probably enjoy the Santa Ema with many of the same foods you'd get with the Cycles. While my good fortune was to try this wine, there wasn't a fortune spent. Look for this in the $8-9 range. RDLR 2003 Syrah -- The Wizard of Covington raves about this wine. When he told me about the RDLR (which stands either for Rich Dark Luscious Red or winemaker Richard de los Reyes, depending on who you ask…) he said, "Make sure you open this wine half an hour before you drink it. You won't believe it when you do." He wasn't kidding -- because he knew I can't let a bottle sit unopened for a half hour without trying it. When we cracked the bottle and poured a bit, I tried to drink it straightaway and was disappointed. I could tell there was an interesting bouquet in there somewhere, but it was masked by an alcohol smell that could be termed "fumey." I endeavored to let this inky wine breathe for at least a little while. When I tried it again after half an hour, the difference was marked. The "fumes" disappear -- leaving you with dark blueberry and blackberry scents, combined with coffee. The RDLR is a big, big wine. Lots of complexity -- more of that dark fruit, good tannin, and some oak. The finish is extremely well-balanced, a little peppery, and goes on and on. While not for wine drinkers that prefer lighter-styled wines…if you want a powerful, juicy wine to kick back with or serve with something that's got some fat in it (beef, lamb, cassoulet, sausage pizza, etc.) to cut the tannins, you'll not be disappointed. The RDLR is right at the edge of the Vine's price range. It normally sells for around $15 or a little over, but I found it on sale for $11 -- so I decided to include it. The Wizard shares his lair, Width of a Circle, with a few friends. He muses on…well…just about everything...in his own indomitable style, and I've visited few websites whose recommended links run from Derrida to Bill Hicks to CREEM! Online.